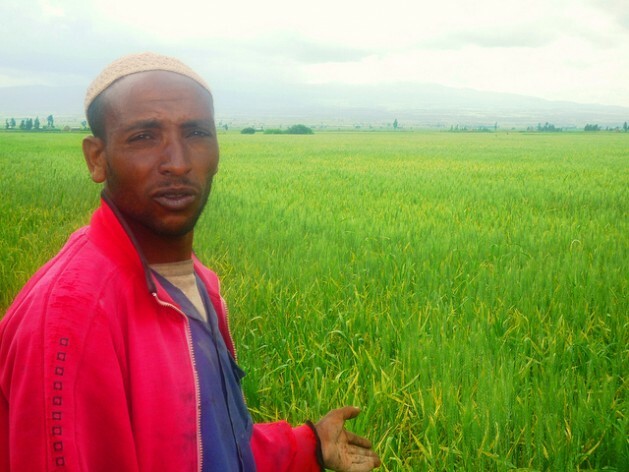 ADDIS ABABA, Oct 11 2012 (IPS) - Africa can ensure food security by producing wheat. New research presented in Addis Ababa, Ethiopia this week shows that the continent has the potential to be self-sufficient. The demand for wheat is growing faster than for any other crop, according to statistics of the International Maize and Wheat Improvement Center (CIMMYT). Researchers are looking into the possibility of making Africa a major wheat producer, as the continent is the biggest wheat importer worldwide. It is expected that this year alone, Africa will spend 12 billion dollars on importing 40 million tonnes of wheat. Researchers at the CIMMYT Wheat for Food Security Conference being held in Addis Ababa from Oct. 8 to 12 say more production on the continent and fewer imports will eventually ensure increased food security for Sub-Saharan Africa. In particular, farmers in communities which are reliant on rain-fed agriculture have the potential to expand wheat production. This could contribute to ensuring food security, as less money will be spent on importing foodstuffs. A report released at the conference focused on 12 countries on the African continent where wheat is traditionally produced. The study was done in Angola, Burundi, Democratic Republic of Congo, Ethiopia, Kenya, Madagascar, Mozambique, Rwanda, Tanzania, Uganda, Zambia and Zimbabwe. These countries have enough natural rainfall for the yields required to become self-sustaining. The study showed that 20 to 100 percent of the farmland in these countries is suitable for profitable wheat farming. Nicole Mason, assistant professor of International Development in the Department of Agricultural, Food and Resource Economics at Michigan State University, and a keynote speaker at the conference, told IPS that there are several factors driving up demand for wheat. Wheat, primarily in the form of bread, pasta and cereals, is the number two staple crop in the developing world. It is also a primary source for protein in most third world countries. While maize currently holds the top position, the demand for wheat is rapidly growing in Sub-Saharan Africa. As urbanisation is one of the key factors behind the increasing demand, alternatives need to be investigated in order to cope with expected urban population growth of 300 percent in Africa in the coming 40 years. If farmers in the region increased their production by 10 to 25 percent, it would be economically profitable according to researchers from the CIMMYT. Hans-Joachim Braun, the director of the Global Wheat Program at the CIMMYT, told IPS that Africa is the biggest importer of wheat in the world and that it has the potential to produce what it consumes. “Africa is very favourable for a lot of crop production, but what is missing are water and fertiliser,” he said. Investments in seed and technology are needed to turn African into a self-sustaining wheat producer. He explained that if water, including dams for irrigation, and fertilisers were provided, Africa could become a food basket to the world for a number of crops, in addition to wheat. Many African countries used to produce wheat on a larger scale until the 1980s. Because of the tonnes of food aid that was donated during this period of time, international prices declined sharply.